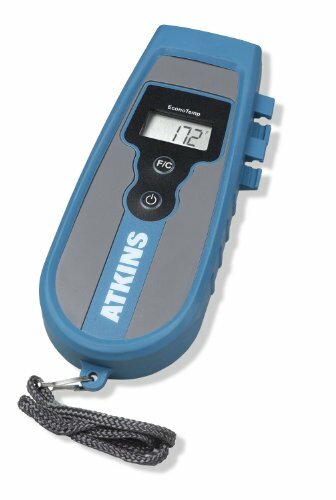 The Cooper-Atkins EconoTemp 32311-K dual-range digital Type K thermocouple thermometer is used for monitoring temperatures of food products. It measures temperature from -40 to +500 degrees F (-40 to +260 degrees C), with an accuracy of + or - 2 degrees F (1 degree C) at ambient temperatures 68 to 86 degrees F (20 to 30 degrees C). This thermometer accepts standard Type K thermocouple probes (sold separately). It has a molded rubber casing for impact and water resistance. The unit operates on a three AAA batteries, and turns off automatically after 10 minutes of non-use to conserve battery life. The European Conformity (CE) marking indicates compliance with applicable European Union (EU) directives, and the NSF (formerly National Sanitation Foundation) listing indicates compliance with applicable safety standards. It is compliant with Waste Electrical and Electronic Equipment (WEEE) and Restriction of Hazardous Substances (RoHS) standards. It comes with a protective rubber casing, a lanyard, and instructions. Digital thermocouple thermometers measure the temperature of air, liquids, or surfaces. They may measure temperature in Celsius, Fahrenheit, or both. Thermocouple thermometers are composed of two conductors of different metals, usually alloys of the same metal, which touch at the sensor end of the thermometer. The difference in conductivity between the two metal pieces produces a voltage flow between the sensor end and the open end of each conductor, which can be used to determine the temperature. Different alloys are used for different temperature ranges. Thermocouple thermometers are used in applications that require a large temperature range and do not require a high degree of accuracy. These thermometers are used in kilns, turbine exhaust systems, and furnaces.